Markedly slower growth and imminent financial crisis have been the common dual predictions for China over the past decade. China’s growth has indeed slowed from its unsustainable breakneck pace in the two decades before the 2007–08 global crisis, but since then has settled down to a steady 6–7% per year, two or three times as fast as advanced economies. Keeping growth going through and since the downturn has, however, required a big increase in domestic credit, raising the risk of a financial crisis. Can China continue to confound the pundits? This depends on the intertwined but distinct issues of growth and financial stability. Let’s start with growth. Michael Pettis, a professor at Peking University, has been perhaps the most vocal and persistent pessimist. In 2012, when China’s growth had already slowed to around its current pace, he bet with The Economist magazine that China’s annual GDP growth this decade would “barely break 3%”. The decade is not quite over yet, but it’s looking like a clear win for The Economist. If you are at risk of losing a bet, try changing the terms. Pettis has an impressively ingenious take on GDP. Unlike many others, he doesn’t dispute China’s GDP data as such. Instead, he notes that this only records “national output”. He says that much of this output growth has been wasted on unproductive investment, which should be written off. Pettis says that in market economies this happens, reducing GDP growth through lower profits. This, however, exaggerates the difference between Chinese and Western GDP. China is hardly alone in unproductive investment and tardy recognition of poor investment. And if we mark to market for poor assets, consistency requires that we revalue assets whose price has risen: housing booms would produce spectacular growth in GDP. In practice, the imperfect answer is that good projects boost GDP over time through higher output and stronger profits, while bad projects erode GDP. Pettis’s argument is only one more reason why GDP is an imperfect measure of living standards. That acknowledged, it’s hard to offer a much better measure. It’s harder still to see how his estimate of current (corrected) growth of 1–2% could reflect China’s reality. Pessimism about China’s financial sector probably peaked more than two years ago, with Tyler Cowen’s confident prediction of an imminent and massive financial collapse, resulting in a long recession. Although he’s a smart and innovative economist, this was a miscall. Since then, bank lending to the non-finance commercial sector has levelled out, but the more comprehensive “total social financing”, including non-bank intermediation and government debt, is now approaching 250% of GDP and still rising. This is not unusually high by general international comparison, but is high for a developing economy and has grown much too fast. Thus the IMF remains pessimistic: “International experience suggests that China’s credit growth is on a dangerous trajectory, with increasing risks of a disruptive adjustment and/or a marked growth slowdown”. But China’s credit situation is different from other countries. It has little external debt, big foreign exchange reserves, and capital controls, so won’t have a crisis like the 1997 Asian crisis. The main overextended borrowers are state-owned enterprises (SOEs) which have mainly borrowed from state-owned banks, so the situation’s “in-house”, and hence easier to restructure. Government debt is modest, allowing fiscal space to soften a crisis. Unlike the 1997 Asian and 2008 global crises, Chinese authorities know in advance that there is a problem and are taking action. China could (and probably will) have a period of painful adjustment as policy stabilises the high debt levels, but a major meltdown seems unlikely. What does all this mean for policy? The thrust of the Pettis’s argument is that China is saving too much. His answer is to encourage consumption. This makes sense and shouldn’t be too hard: most governments have to wrestle with the opposite and more intractable problem of keeping the public happy while restraining consumption. Pettis is surely too pessimistic about investment opportunities, recalling China’s low per capita capital stock. One of the characteristics of heavy infrastructure is that it is sensible to build excess capacity initially: think of the Sydney Harbour Bridge, which reached capacity thirty years after construction. New Yorkers wish the Second Avenue Subway had been built ahead of demand when it was first proposed in 1919. 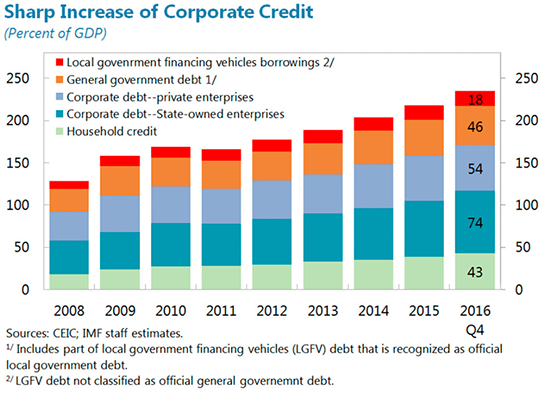 China has an opportunity to restrain credit without harming growth by limiting SOE borrowing, which was responsible for 60% of the rise in corporate debt from 2008 to 2016. The SOEs produce only 15–20% of industrial output. The special focus should be on the “zombie” SOEs, which account for nearly 15% of corporate debt. The often-mentioned rise in the ratio of credit-to-growth should be read as a positive rather than a negative: cutting back credit growth shouldn’t damage growth much. Of course, restructuring SOEs and reining in local governments present vexed political challenges. The IMF’s suggestion that China should accept lower growth rates in order to limit debt growth seems to be mistaken logic. If a key reform is to restructure SOEs, slower growth will make this more painful, and therefore less likely. Fiscal expansion could soften the restructure. China should be able to maintain the 6–7% growth of recent years as it deepens capital and moves towards the technological frontier. At some stage, probably a decade or more away, China will run into the same growth-constraining factors that slowed Japan and South Korea. But not yet. This week's column examines some different views on global supply chains in the age of robotics, new figures on Chinese investment in Australia, and some unusual criticism of One Belt One Road from China's elite. Xi’s itinerary during his three-day whirlwind visit to the city, his first as President, was packed with highly symbolic events showing Hong Kongers, and the world, who’s boss.